1. Why is Bust Bunny Breast Enlargement so effective? Bust Bunny contains Phytoestrogens (naturally occurring non-hormonal plant estrogens). These phytoestrogens stimulate your body to produce new breast tissue growth. Your body responds to Bust Bunny the way it responds to puberty or pregnancy; with renewed glandular tissue growth in the breast receptor sites. 2. When should I take Bust Bunny? Twice a day. One in the morning after breakfast with an 8oz glass of water and one before bed with an 8oz glass of water. 3. How Likely Is It That Bust Bunny Will Increase My Bust Size? Most women experience a noticeable improvement in fullness and toning in the breast area, so there is a high probability of success for you. Women with a cup size of ‘A or B’ often report an increase of one to two cup sizes. Differences in individual metabolism and body chemistry obviously determine the outcome for you personally. 4. Are Bust Bunny Capsules Safe for Me to Use? Bust Bunny is an all-natural herbal dietary supplement containing absolutely no additives or fillers. All ingredients in Bust Bunny are listed on the FDA’s GRAS (Generally Regarded As Safe) list. There are no known negative side effects. *Before taking any dietary supplement, women with special medical conditions, pregnant or lactating are encouraged to consult with their physician first. 5. Once I Reach My Desired Breast Size Is It Guaranteed That My Breast Will Remain That Size? While very little in life is guaranteed, Bust Bunny’s aim is to ensure you’re happy with your breast size forever. Just like how stopping exercise has a likely chance to cause weight gain, stopping Bust Bunny can have that effect as well. However, in most cases, those who kept up a healthy diet and maintained Bust Bunny allowed their bodies to maintain the natural bust size they’ve always wanted. The natural ingredients found in Bust Bunny have been known to help with menstrual complaints! It has not been known to interfere with any birth control or menopause. In fact, it can soothe menopausal complaints as well! 7. How Many Pills a Day Would I Have to Take? Bust Bunny should be taken once in the morning and once at night, after food and water. 8. Will It Be Effective Even If I Continue to Exercise and Manage My Weight Loss? 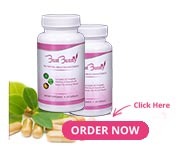 Yes, in fact, we’ve seen some results that mention taking Bust Bunny has allowed for an even healthier and sometimes speedier weight loss and control. 9. Will My Name Be Put on a Mailing List, or Sold to Other Advertisers? No personal information will be shared with or sold to any other company; nor will you ever be put on any mailing list. See our Discreet Shipping page for more information. 10. How Long Have Women Been Using Breast Enlargement Capsules? Bust Bunny Capsule is the original, natural breast enlargement pill and has been sold worldwide. Please view some of the letters of thanks that we have received on our testimonials section. 11. Are Bust Bunny Capsules Clinically Proven? NWBM, INC, under the direction of Dr. Eric Anderson in California, supervised a clinical study. Bust Bunny Capsules were tested with the help of 96 women over a period of 24 months. The results of their investigation documented breast enlargement of one-half inch to three inches over a 90-day period (average). Upon the completion of the research Dr. Anderson confirmed that the combination of the ingredients creates an exponentially stronger more effective product. 12. What Makes Bust Bunny Different and Why Is It More Effective? NWBM, INC is committed to providing you with the most powerful, innovative dietary supplements in the market made from only the finest quality ingredients available. Bust Bunny contains absolutely no fillers or additives, and is made from 100% pharmaceutical grade ingredients. Bust Bunny is known for containing all 13 key botanicals for assisting in breast tissue regeneration. 13. What about the Other Breast Enhancement Products on the Market? Since the success of Bust Bunny many companies have tried to copy our product without success, many boasting that they have a product that is faster and cheaper than Bust Bunny. Please watch for imitations. Think about it, do you really think you could get bigger breasts from just any herbal pill? 14. What Else Is Bust Bunny Useful For? Bust Bunny Capsules do not themselves contain estrogens or hormones but promote the natural activity of hormonal production. Because they replace excess estrogen in the system they also calm hormonal swings and dramatically reduce monthly pre-menstrual discomfort. Many women also report accelerated hair and nail growth as well as increased sexual desire. 15. How Long Will It Take before I Start Noticing Results? Most women begin to see results in 6 to 8 weeks. However, results may vary due to differences in individual metabolic rates and body chemistry. Within the first 4 weeks you will notice an increase in fullness and firmness; this is the first sign that Bust Bunny is working. 16. How Much Growth Can I Expect? Women using Bust Bunny capsules experience amazing improvements in both firmness and fullness of their breasts, with increases of one, two, and sometimes even three full- cup sizes. 17. Does Bust Bunny Cause Acne or Pimples? 18. Will Bust Bunny Cause Weight Gain? No! Bust Bunny facilitates the development of the mammary glands by exerting mild estrogenic effects and helping to balance the female hormonal system. There have been no reports of women experiencing weight gain because of using Bust Bunny. 19. I'm Using Another Product Can I Grow Larger on Bust Bunny? Yes, unlike other products in the market, which stop working once you’ve reached a certain size and firmness, Bust Bunny puts you in absolute control over how large or firm you want your breasts. Women grow on average an extra ½ up to 1-inches larger with use of Bust Bunny capsules! Women switch from other products to Bust Bunny everyday! 20. I Want Breast Implants Why Should I Try Your Product? Why would you go for breast implants when you can get the same results with Bust Bunny capsules, with no side effects! Women who use Bust Bunny capsules for at least a couple of months see results ranging from approximately 1/2-1.5 to 2.5- and up to 4-inches plus. Results also include uplifted, toned and firmed breasts. You don’t need to go through the costs, risks and pain of implant surgery when there is a safe, much more effective & inexpensive option! Bust Bunny will not only give you more voluptuous breasts, it will also have positive effects on your whole well-being! You must be aware that saline breast implants do not last a lifetime. Women who get these implants will require additional surgery at some point to remove or replace them because of age or complications. 21. I Have Breast Implants and It Has Started Sagging Now. Can Bust Bunny Help? According to our customers, yes. We have had numerous reports of women using Bust Bunny post-operation to enhance the appearance of their implants. Women who have had breast implants can expect the same growth as any other woman as long as there is no damage to the breast tissue from surgery. It can help with dimpling, sagging, & other aging effects. 22. I Am Forty-Six Years Old and My Breasts Have Begun to Lose Elasticity, Am I to Old to Think of Doing Something about It Now? You are never too old to feel like a woman. Women of all ages can use what is available as long as they have no significant medical problems. Bust Bunny capsules can normally help get back fullness and firmness as well as help with menopausal symptoms, PMS and other discomforts. 23. Would My Ethnic Background Have Any Determining Factor with the Final Results? Absolutely not! Women all over the world take Bust Bunny daily; all of which can equally experience the same amazing results. 24. Once I Have Achieved the Growth I Desire Will I Maintain the Size? Consider Bust Bunny like a multi-vitamin, as long as you take our supplement, your breasts will reap the benefits for a lifetime with no surgery and scars. Our natural herbs will continue to replenish your body by balancing your estrogen levels for favorable results. If you stop taking Bust bunny, there’s a chance your body will slowly return back to its original state, but that depends on your estrogen and genetics. That’s why we’ve created a formula that’s lower than the price of one coffee a day. You should maintain all of the size and fullness you have gained, by following this recommendation. The results are permanent. 25. Is Bust Bunny Guaranteed? Absolutely!!! Following hundreds of testimonials and over 12 years of studies, we are proud to say that this product does work. We are so confident that Bust Bunny will increase your total well being and your breast size that we offer 90-day returns and refunds policy – one of the best return policies in the market. 26. I'm Confused on How Much of the Product to Purchase. Would One Month Be Enough, or Do You Think I Would Need More? Realistically, six months is typically the standard time frame for significant tissue growth. We recommend that once you reach the desired size, that will be in approximately 2-3 months, you should reduce your dose to just one capsule daily to maintain your size. By following this recommendation, you should maintain all of the size and fullness you have gained. 27. Will Anyone Know What's in the Package When It Is Shipped? Your privacy is a primary concern. We take great care to make sure that information about your order is kept private. All packages are sent in plain unmarked packages with a return address from NWBM, INC. There is no mention on the outside of the package as to what is contained inside. Furthermore, your name will never be given or sold to any other company. 28. How Long Will It Take to Get My Order? All orders are shipped via USPS within 24 to 48 hours. Generally orders within the United States take 2-5 days to arrive; international orders take 7- 10 days depending on the country. 29. Is It Safe to Order Online? Absolutely! We use 128-bit secure socket layers to protect your personal information; one of the safest processing system on the web. All information about your order is encrypted, and cannot be viewed by anyone else. 30. I'm Not Sure How Much I Should Buy? Bust Bunny natural breast supplements increase your breast size to fit your body perfectly. Along with a healthy diet, Bust Bunny capsules should show results within the first 90 days. Continued use of Bust Bunny will not only allow your breasts to be the size and shape you’ve always wanted — but will allow your body to be healthy as well. 31. I Didn't Read Any Side Effects on Your Web Page, Is That True? In most cases, Bust Bunny has shown no side effects. As all the ingredients are naturally found in most foods and plants, the side effects are mostly all beneficial. However, it’s always a fantastic idea to consult with your physician before adding Bust Bunny to your diet—just to be safe! 32. This Product Has Reported Increased Sexual Interest. Is That to Say It Will Increase My Chances of Producing More Eggs? I'm Not Looking to Have Any More Children. 33. Do You Offer Discreet Shipping? Yes, 100% guaranteed! There will be no sign as to what’s within the package. This means not even your delivery person will be aware of what you ordered. Your order is going to be delivered in unmarked packaging and boxes to protect your personal privacy. See our Discreet Shipping page for more information. 33. Will Your Company Name Show Up On My Credit Card Statements? No. We guarantee worry-free credit card statements! Bust Bunny has made it so your credit card statements descriptor is just as discreet as our packaging. This way you do not have to worry about your significant other and or your parents seeing your purchase from Bust Bunny. We want to make this as simple as possible for you and have thought of every situation that may be a concern of yours.